Grant Smith is a Kimberley artist and retired art teacher. When Grant first moved to the Kootenays, he donated “Giant Sitka”, a block print sold as a fundraiser for Wildsight (then EKES). Nearly two decades later, the print hangs on the walls of our office, reminding us of the simple beauty of a tree and the history of forestry in the Kootenays. Grant has stepped forward again this year, donating five artworks, inspired by the plight of the mountain caribou, to help protect them. Grant’s artworks will be for sale by auction until November 26th with every penny going to help protect mountain caribou and their old-growth forests they depend on. The artworks will be on display at East Kootenay screenings of “Last Stand: The Vanishing Caribou Rainforest” and you can place your bids in the online auction. I sat down with Grant to learn about his art, his inspiration and what mountain caribou mean to him. Tell us a little bit about yourself: where do you live, how did you become an artist? Almost thirty years ago, I was very fortunate to receive a teaching position on the western flank of the Rocky Mountains in a mining town called Kimberley. The town was transitioning from the closure of the Sullivan Mine and becoming a tourist town. Many students might remember me as the art teacher at Selkirk Secondary School. Art is something I have always done and animals have been a favourite subject of mine from a very early age. 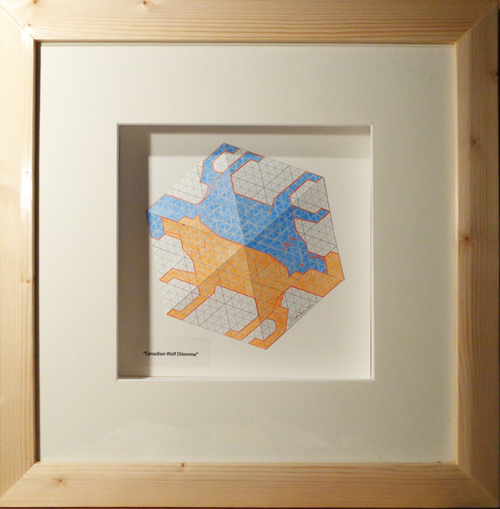 What inspired you to create these mountain caribou artworks? When I learned that Kimberley was adjacent to remnants of herds of mountain caribou in the Purcell and Selkirk mountain ranges, I took an immediate interest in them. I already knew about the vast herds of barren land caribou in Canada’s North, but having mountain caribou this far south was exciting. Unfortunately, I quickly learned that these animals were dying out due to the destruction of the old-growth forests. These animals hadn’t been cared for. Working with mountain caribou imagery in my artwork gives me time to think about and care about these unusual animals. Art can have a powerful impact. What are you trying to say with these artworks? 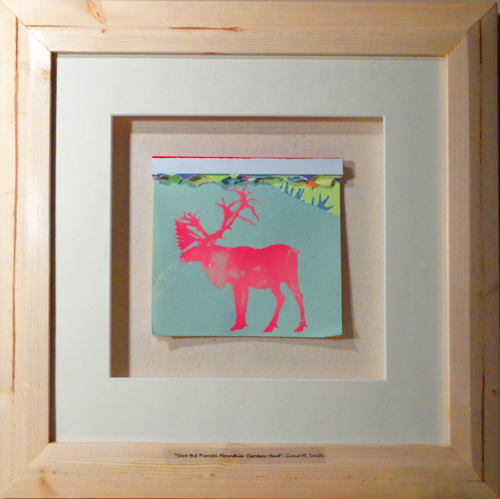 There are a few messages which I wanted to express in my mountain caribou artwork. The “Save the Purcell Mountain Caribou Herd” tear away pad illustrates that we’ve lost most of the herd and only an estimated dozen animals are left; the situation is critical if it isn’t already too late. “Mountain Caribou-Winter Range” depicts the animal’s unique adaptation of traveling to higher ground as the winter progresses, where the caribou eat lichen hanging from old alpine trees and use the deep snow to escape their predators. In an attempt to help the local mountain caribou escape extirpation, a “wolf kill” program was begun and I’ve created two artworks to express my thoughts and feelings for the wolves. “Wolf Dilemma” shows the wolf as historically beloved on the one hand and maligned on the other. 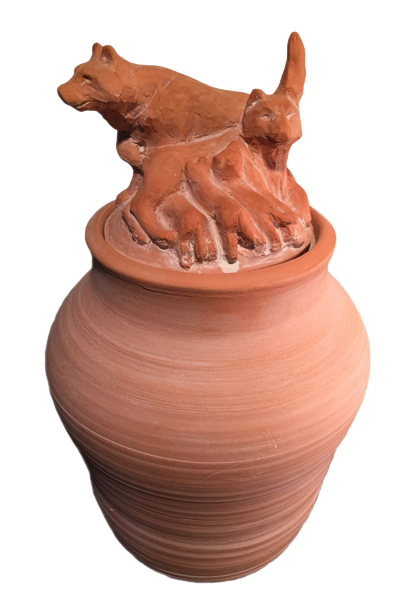 The “Wolf Urn” gives the wolves that have been shot a symbolic burial place and reminds everyone of the unjust price the wolves are paying for our mismanagement of the mountain caribou’s rangeland. What is it about mountain caribou that drives your activism through art? When I look at the shape and movement of mountain caribou, I am reminded of the ice age and how over thousands of years these animals have survived harsh winter conditions; they have become very stoic. I hope that others share the respect and reverence which I feel for the mountain caribou. Thank you very much for donating this art to Wildsight. What inspired you to donate? I know that there is a small and devoted group of volunteers with Wildsight who have studied and monitored the local mountain caribou herds. They’ve brought attention to the plight of the animals and formulated plans to initiate a recovery in the local mountain caribou populations. Perhaps, more people will find pleasure in donating money if they might also have an opportunity to own and display some artwork. You can place your bid in the online auction here. If you aren’t comfortable on eBay, contact us directly.